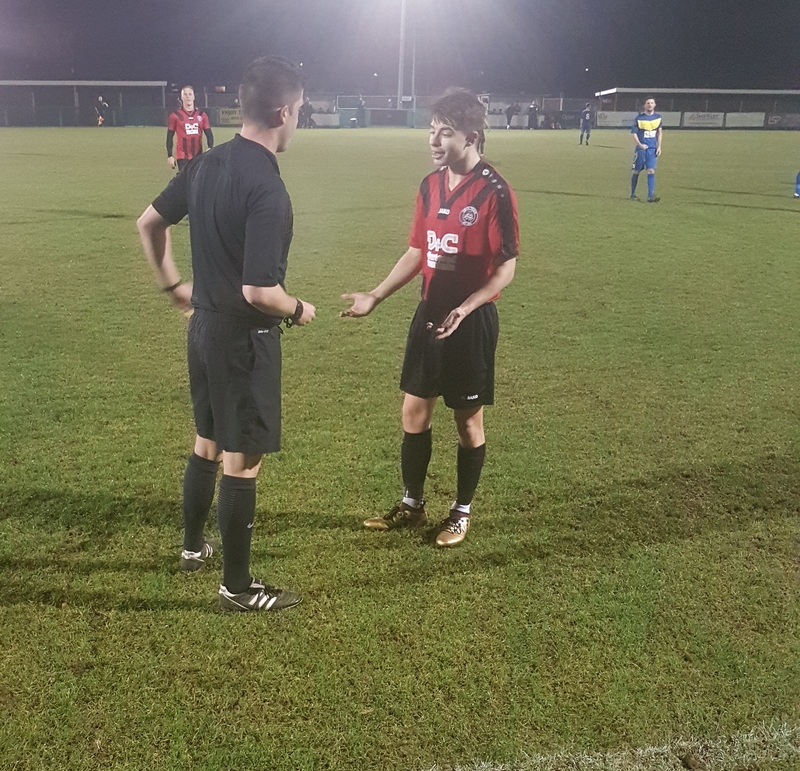 A crowd of 54 made it down to Oakwood on Wednesday night for a SCEFL Challenge Cup Third Round game between Erith Town and Hollands & Blair. A glance at the League table as a pointer to the direction of this tie would probably be unwise as the visitors had recently got their first win of the season and are certainly not the pushovers that their bottom-placed position may suggest. The Dockers came into this one unbeaten in three but if they wanted to get through to the Quarter Finals they would have to perform well. They certainly started well. Stuart Zanone hit the post in the first couple of minutes when rising highest to head a cross down low that the keeper Ronan Forde could only push on to the upright and away. On ten minutes Zanone had another chance, one that he should have scored, as he made time for himself in the box to turn and shoot but this effort was high and wide and the in-form 33-year-old striker will be disappointed to have not put that one away. Hollands and Blair then came back into it and had two decent efforts within a minute. Dave Raggett is a beast in the centre-forward position for them and managed to get his head onto a cross from the right but Adam Molloy was well positioned to make the save. Soon after that a free-kick was floated to the back post where Steve Dampier was waiting but his accuracy with his head was not good enough and he had to see his effort fall just wide. The game then went through a strange twenty minute spell where the referee took centre stage. Every free-kick awarded was followed by a minute long dressing down by the man in black Jack Owen to the player committing the foul, and he awarded a lot of free-kicks. For a man that had his assessor watching it was a baffling performance by him that continued throughout the first half and was overshadowing what was a decent and even game of football. Fortunately the Erith Town players did not let it get to them and in the 34th minute they took the lead. The visitors failed to properly clear a set-piece and when the ball was headed back in to the box it was Jack Hooper who acrobatically got onto the end of it to volley / overhead kick it into the far corner. A great goal by the centre-back and one that his celebration showed that he clearly enjoyed! 1-0 to The Dockers. Five minutes later the lead was doubled. Osman Ali Proni got the ball on the far side of the box and despite calls from all around to deliver it early he kept possession to himself and somehow made it past the defence to put a delayed cross through to the far post where Sidney Warden was able to run on and slide the ball past the keeper. It was a good finish from the young man who was probably to scared to over-celebrate after getting a ridiculous yellow card just minutes before. Just before the break Hollands did come close to getting back into the game when hitting the post after a mazy run and shot from Travis Jackson but at the half-time stage Erith deservedly had the lead. For the second half the game was fairly even. The home side had the two goal cushion so did not have to push it too hard and to give Hollands & Blair credit they did not give up on it. Molloy was often called into action but was always in control of the situation and it didn’t really look like he was going to be beaten. Hooper and Tamer Bilal were able to deal with Raggett fairly comfortably by now and Clint Gooding brought off the big man in a bid to change things for them. However, it was Erith that had that extra gear that they could go in to and they did just that in the 69th minute when Zanone, who was a handful all night for the away defence, got on to a cross to head down to Warden who had the simple task of tapping in to the net for his second of the night. This one was over as a contest now, 3-0. With ten to go it should have been four. Warden ran with the ball into the box but was brought down leaving the Mr Owen little choice but to point to the spot. Being so late into a cup game that was effectively decided already it would have seemed normal practice for the man on two goals to attempt to get his hat-trick but after recent penalty misses, Erith had confirmed Zanone as their new penalty taker and it was him who placed the ball down to get what would have been his second of the game. He hit it well and low to the Keepers’ left but Forde pulled off a great save however he could only palm it into the path of both Tobon and Charles who had reacted quickest to the rebound. Unfortunately they both ended up kicking each other and not the ball which rolled away to safety. A comedy moment fortunate to not have any serious effect on the outcome of the tie. The game was then controlled by Erith Town until the final whistle and it would be them who would be heading on to the Quarter-Final. I was impressed with Erith. They have a young team on the whole, with 5 players under 19 on show tonight and mixed with the experienced players around the side they are an entertaining team and a joy to watch. Stuart Zanone has been at so many clubs at this level and higher and he gives them a lot of energy up top and opens up space for the younger more creative players to do their thing. It has been a tough League campaign for them with injuries to key players causing them set-backs but they sit in congested middle of the table position where a top half finish is certainly within their ability. But tonight wasn’t about the League, it was about the Cup and now they are down to the final eight don’t be too surprised if Adam Woodward and his young team make it all the way to the final. Thanks to both teams for putting on a great game and to Erith Town for the hospitality, will be back soon.